Vivian Campbell, Vinny Appice, Phil Soussan, and Andrew Freeman collectively known as Last in Line, are set to release their second album, “II” via Frontiers Music Srl on February 22. New York based Livesay is a prime example of a band that has flown under the proverbial radar and has self-sustained 4 incredible albums: S/T (1996), Darkest Hour (2002), Awaken the Giant (2010) and Frozen Hell (2016). Livesay is not a novice to the big stage and has opened for a multitude of hard rocks premier acts such as Ronnie James Dio, Y&T, Dokken, Lynch Mob, Ratt, Thin Lizzy, Vince Neil, Sebastian Bach, Quiet Riot, Michael Schenker, UFO, Fates Warning and many others. In addition to appearing at the Rock N’ Skull Festival 2 years in a row, they have headlined many times as well. With very little major backing, it’s been a willingness and belief that has driven this band. The new album titled “Chronicles” features 13 Tracks that bring the history of Livesay full-circle. From the earliest unreleased material from 1992's Demo ep "Live & Let Rock that features the tracks “Live & Let Rock” and the ballad “Fallen Nights” to the best of 1996 - 2016. The “Chronicles” album coverrs the bands career from humble beginnings and culminates with the brand new track and single, “International Man,” recorded at Fox Hollow Studios, engineered by Sal Lorello and mixed and mastered by Jeff Westlake (Hydrogyn) of Ridgeline Productions. The new track features new Vocalist Mike Gill (Beyond Purple) and ushers in a brand new beginning that will feature a new album in 2019. “Chronicles” is certain to draw the attention of hard rock fans no matter what their taste and drops November 30th on RFL Records/Cargo Records Distro Europe. PRE-ORDER CUSTOMERS WILL RECIEVE 3 UPDATED TRACKS IMMEDIATELY. Remixed and with ERIC RAGNO Keyboard parts added. Gathering Of Kings debut album "First Mission" will arrive in late January 2019! The Album was produced, mixed, and mastered by Thomas Plec Johansson (Soilwork, The Night Flight Orchestra, Nocturnal Rites, Dynazty) at The Panic Room in Skövde, Sweden. All songs written by hugely talented Victor Olsson except "The Runaway", which was written by Maurice Gibb & Robin Gibb from Bee Gees. The song is a cover of Carolas hit single from 1986. So that's a tribute to the best swedish female singer of all time! The cover artwork was created by the German artist Markus Vesper. Rock / Metal Icons WITHIN TEMPTATION’S are back with a double helping of new music. Raise Your Banner and Mad World are taken from the highly anticipated new album Resist which will be released 14. Raise Your Banner features In Flames frontman Anders Fridén. This wake-up call soars through the album track list as a sharpened knife. RESIST is armed with ten anthemic tracks, driven by grand melodies and dark hooks. “RESIST is a true milestone for us. If it wasn’t for RESIST, WITHIN TEMPTATION wouldn’t be here anymore.” “Resist is a true milestone for us. If it wasn’t for Resist, Within Temptation wouldn’t be here anymore. With this record, we’ve taken inspiration from modern music and gave it a face - a very dark one. Sometimes it feels that today’s pop music lacks a rebellious edge. He’s back again! But was he ever truly gone? Rock’N’Roll with a capital ‘N’ showing that anything goes in this profession – is experiencing what feels like its seventh or eighth spring. And in the middle of it all: John Diva & The Rockets Of Love. The flashy band in the style of the eighties has been blessed with the talent of bringing a breath of fresh air to classic rock music. They are the rightful heirs of an era in which Van Halen, Aerosmith, Bon Jovi, Whitesnake, Scorpions, Guns N` Roses or Mötley Crüe roved around all over the planet and took apart anything they could get their hands on. John Diva is charged US entertainment at its very best. At John Diva’s side are the guitarists Snake Rocket and J.J. Love, bassist Remmie Martin and drummer Lee Stingray jr. who, in previous years, have pulled off their spectacular performances in front of thousands of fans, three times at the Wacken Open Air alone, amongst others. Once you have witnessed this band on stage, you know how exciting and stimulating strenuous Rock’N’Roll can be. All twelve songs were produced by Michael Voss (Mad Max, Michael Schenker, Tony Carey etc..) in the ‘Gizmo 7 Studios’ in Malaga, Spain, the ‘Principal Studios’ and the ‘Kidroom Studio’ in Münster, with Chris von Rohr (Krokus, Gotthard) as creative supervisor. A dream team of international renown with the experience of real Rock’N’Rollers. Hence: Welcome to an album that will revive your Rock’N’Roll life as well! "Mama Said Rock Is Dead" will be released through SPV/Steamhammer on February 08th, 2019 as CD DigiPak, 2LP Gatefold, download and stream. Kane Roberts is back with a new solo album, “The New Normal”, which will be released on January 25, 2019. The first taste of music has been released from the album in the form of the track, “Forever Out Of Place”. Kane has involved some really amazing friends in the making of “The New Normal, including Alice Cooper, Alissa White-Gluz of Arch Enemy, Nita Strauss, Babymetal drummer Aoyama Hideki and his former Alice Cooper bandmates: Kip Winger, Paul Taylor, and Ken Mary. Three years in the making, “The New Normal” melds the old and new in metal for a truly outstanding album. Kane comments on how the collaborations came to be: “I noticed artists that were busting down doors and at the same time kickstarting new ways of thinking about life and creativity. I knew I wanted to try to work with some of them. Nita Strauss is a killer guitarist. She really tore it up on the song “King Of The World". Her work on it woke me the f*** up and forced me to explore new guitar techniques to compliment her insane skills! Alice Cooper....no one individual has scorched the earth like my former boss. I started getting into recording "Beginning Of The End" and realized I needed Alice to sing a duet with me. Not just a line, not just an intro, but sing throughout the song. I took the shot that he might be available at some point to get involved and when I called, he said "I’m in Hollywood. I'll be right over." Full on stroke of luck. My approach to much of the album was cinematic in the hope that sounds and lyrics would create imagery and emotion beyond what I had done before. Keeping with that idea, I had Alissa White-Gluz (Arch Enemy) fall from the sky like some pissed off dark angel in the middle of the song with Alice and I and burn the place down. Her attitude and singing prowess is stunning and I was so jazzed when she agreed to participate. I was obsessed with getting drum monster Aoyama Hideki from Baby Metal. After he heard the song, he immediately came on board and played with controlled fury like only he can....AMAZING! I also was also able to work with Brent Smith (Shinedown) and Lzzy Hale (Halestorm) on songwriting and they were of course a blessing to the entire process. Of the many iconic images of '80s rock 'n roll, one that has certainly stood the test of time is Alice Cooper’s then “Rambo-looking” guitar player shooting fire from his M-80 shaped guitar. That guitar player is none other than Kane Roberts, an accomplished musician and singer who, after leaving Cooper's band, went on to record a total of four solo albums (including the “Phoenix Down” project released by Frontiers Records in the late '90s). Kane’s name and musical abilities first came to prominence on Alice Cooper’s “Constrictor” and "Raise Your Fist And Yell" albums. The tours and popular videos for each made Kane a well-known face in the scene, especially for his outstanding guitar skills, but also for his body-builder image and his iconic machine-gun guitar. West West Side Music, the company responsible for mastering over 15,000 records (Mastodon, Yes, Monster Magnet, Fleetwood Mac, The Misfits, etc...) has launched the independent label Deko Music, which is distributed by Warner Music Group’s ADA (Alternative Distribution Alliance) in North America and the Target Group in Europe. The label is headed up by West West Side Music owner and Grammy award-winning engineer Alan Douches, with veteran record producer Neil Kernon, Billboard charting artist/performer Charlie Calv and long-time industry sales veteran Bob Ardrey. Deko Music’s inaugural releases include specialty vinyl titles from projects with Danger Danger vocalist Ted Poley, and the legendary Angel with Punky Meadows and Frank DiMino (see release listings below). Charlie states, “We are starting out with some veteran artists that we feel best represent their genre and setting our sights on developing some newer acts in the very near future”. In 2019 we will see some archive releases from legendary New York band the Good Rats, former Styx member Glen Burtnik, a special live recording of Tygers of Pan Tang featuring John Sykes (Thin Lizzy/Whitesnake), former Kansas singer Steve Walsh, and the first new studio album in 40 years from legendary jazz composer GilEvans. The label will announce additional new artist signings and future releases in the upcoming months via the labels official website. Please visit www.dekoentertainment.comfor up-to-date artist and label news and full list of releases. Acclaimed Swedish dark melodic metal masters EVERGREY are set to release their new studio album, titled 'The Atlantic', on January 25th 2019. 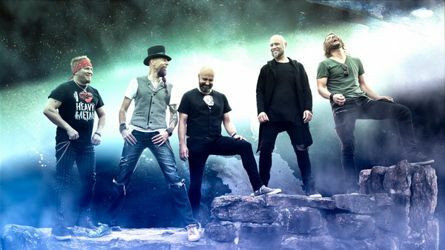 The band has worked extensively on the follow-up to their highly successful 2016’s effort 'The Storm Within' (which entered the charts on high positions in numerous countries). Again, EVERGREY teamed up with Jacob Hansen, who - just like with the band’s previoous releases 'The Storm Within' and 'Hymns For The Broken', took care of mixing and mastering. “Guys! This is album number 11! Isn't that just sick?! It’s also the 3rd album of a concept that might have reached its destination or at least one conclusion. It might also have been something that some of you saw coming or anticipated? We’ve fought through giant private obstacles as well as an extremely complicated break-in at our Headquarters studio to bring this album to you. So at the same time as it's certainly not been painless or at all easy, it’s been rewarding in new ways and our creativity has been painted in colors of honesty and sincerity. 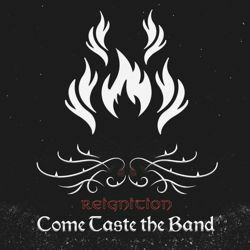 REECE return with LOST IN TRANSLATION, the fourth single from their debut album, IGNITED. The track is a stripped down ballad which shows the bands softer edge. This follows on from a successful campaign of touring across the UK promoting the single FALLING DOWN, which received critical acclaim following airplay throughout the UK, US, Germany and Australia. The single featured in the Top 10 indie charts in Canberra, Australia and has been aired on HARD ROCK HELL, TOTALROCK, and PLANETROCK radio shows and heavily featured on ROCK RAGE RADIO in Germany. LOST IN TRANSLATION will go on sale on Monday, 3rd December on iTunes, Amazon etc... and will coincide with the release of the video. REECE have spent the past few months touring around the UK with new drummer LEE NICHOLAS. Lee comes with a wealth of experience, having toured for several years with the band ALSO EDEN, and has previously played a handful of gigs for Ex-Europe guitarist KEE MARCELLO, who REECE supported on his recent tour of the UK. 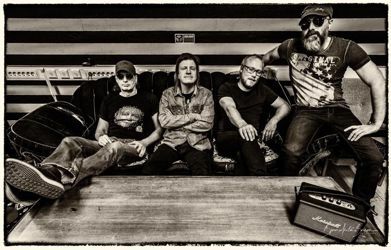 REECE are now gearing up for a bumper 2019, with slots at HARD ROCK HELL AOR, ROCKWICH FESTIVAL, GLASTONSELFY, WARTON MUSIC FESTIVAL and DRUNKEN MONKEY FESTIVAL to name a few, with more to be confirmed, alongside a couple of dates in Ireland, and a gig at Bannermans in Edinburgh during March. The band will wrap up their current Tour at the start of December, to continue writing their next album which should be released around Autumn 2019. Dark Star Records is pleased to announce that the Chicago based symphonic metal band DiAmorte have just released their new full length album THE RED OPERA featuring Mike LePond (Symphony X) and Markus Johansson (THEM). DiAmorte is more than music, it is an experience. A story set to the sounds of a savage orchestra, opera, and metal instrumentation. Each show, uniquely presented with live performers that build the atmosphere is each song, setting the nature of stage and bringing to life the lyrics. A stage show honed and crafted over six years time complete with choirs, players, special fx, and various performers whose presences conclude the experience, DiAmorte is as much an opera as it is a metal show. Eventually they returned to circle around Australia - the land that shaped the Oils and their music. Appropriately they started with some homecoming gigs in the outback before hitting the tropical north where they campaigned against nearby coal mines that would further endanger the world’s largest living organism - the Great Barrier Reef. From there the tour braved some torrential downpours as it headed south, down the coast. It then rolled across the country where this band first cut their teeth, rekindling old memories and creating new ones with every song, and every show. From the vineyards of the Hunter Valley. To the banks of the mighty Murray River and the shadow of Hanging Rock. Onto the cities - Canberra. Adelaide. Perth. Hobart. And then to the Myer Music Bowl on the night after the Melbourne Cup where guitarist Jim Moginie tore his hamstring from the bone onstage and was forced into a wheelchair for the last 4 gigs. Finally this epic tour circled back to the city where it all began. The venue? Sydney’s Domain - a place that encapsulates a nation’s history. For thousands of years it was a ceremonial site for the local Gadigal people. In 1788 English forces landed nearby and turned this land into the Governor’s personal playground. In the 1830’s it became a public park. It’s been under threat from developers ever since. It’s hosted all sorts of sporting and cultural events but over the 20th century the Domain became best known as the home of soap box oratory and political rallies. From the Great Depression through to the Vietnam War this is the place where people came together to discuss and debate the issues that shaped modern Australia. And so after 77 gigs to over half a million people around the world this is where The Great Circle would finally come to a close. Two hometown shows in this special place. The first date? November 11. Known to some as Armistice Day. 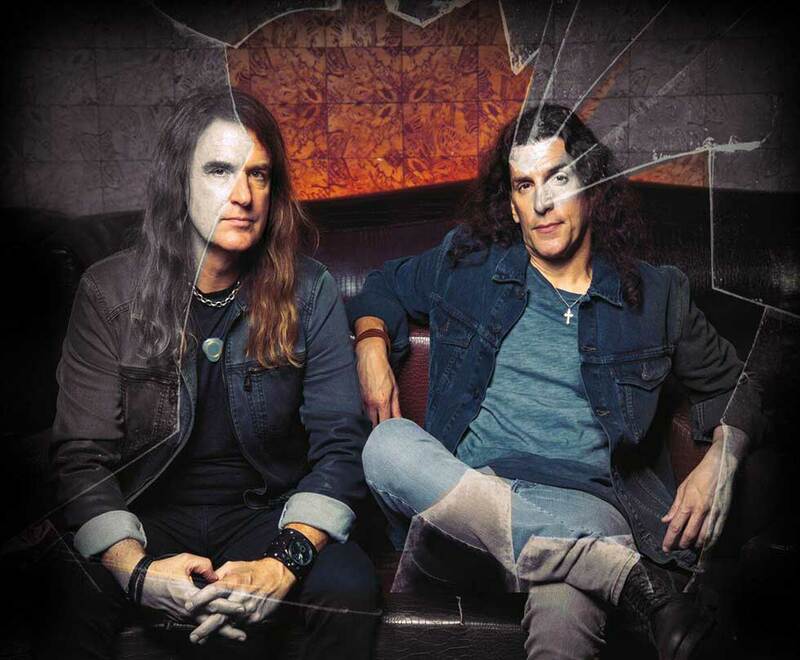 ALTITUDES & ATTITUDE featuring ANTHRAX bassist Frank Bello and MEGADETH bassist David Ellefson, will release it's debut album, "Get It Out", on January 18, 2019 via Megaforce. The follow-up to ALTITUDES & ATTITUDE's 2014 self-titled EP was once again produced by Jay Ruston (ANTHRAX, STEEL PANTHER, STONE SOUR), with Jeff Friedl (A PERFECT CIRCLE, ASHES DIVIDE) returning behind the kit. The track features a guest appearance by ANTHRAX guitarist Jon Donais. A kind of rock 'n' roll primal-scream therapy, "Get It Out" is the result of nearly four years of writing and recording sessions — and decades of touring, searching, striving and liiving. "I've learned that writing songs is very cathartic," says Bello, who has long made songwriting a daily practice. When ANTHRAX is off the road, he tries out new material at open mics around New York City. "A lot of these lyrics are about the inner struggles of my life, and about the rage that has built up from my life experiences — my brother's murder; my father abandoninng my family when we were young, leaving us with no funds to pay the bills," he says. "The ups and downs of life in general. I've always had an anger inside that music really helps me deal with." Boasting a deep bench of guest stars, including Ace Frehley (ex-KISS; the track "Late"), Gus G. (OZZY OSBOURNE, FIREWIND), Nita Strauss (ALICE COOPER), Christian Martucci(STONE SOUR) and Satchel (STEEL PANTHER), the record also represents the fulfillment of a lifelong but little-known ambition for two uniquely gifted artists. As Bello puts it, "All I ever wanted to do was write good songs. I've always been a melody guy. I love hooks; I love catchy songs with a good riff." Bello and Ellefson debuted ALTITUDES & ATTITUDE in early 2014, with a self-titled three-song EP that earned the duo airplay on SiriusXM and an appearance on VH1 Classic's "That Metal Show". Those tracks — p;"Booze and Cigarettes", "Tell the World", "Here Again" — are includedd on "Get It Out" as bonus cuts, in remixed and remastered form. Ellefson explains that "ALTITUDES & ATTITUDE could have only happened at this moment in time" — when the titans of thrash metal's "Big Fouur" are older, wiser, kinder and more open creatively. "When you're still climbing up the hill," he says, "there's no room for friendly competition. But once you've been to the top of the hill and you've seen the view — which all of the 'Big Four' have — it's okay to breakeak bread, hang out, have a drink." Or, in the case of ALTITUDES & ATTITUDE, delve into hard-rock songwriting in a profound way. "To hear other sides of us as artists — not just as muusicians and performers, but as artists." Italian progressive metal band, LAST UNION, featuring Mike LePond (Symphony X) on bass, Uli Kusch (ex-Helloween, ex-Masterplan) on drums, and as guest James LaBrie (Dream Theater) on vocals, have announced the release of their debut album 'Twelve' on December 21, 2018 via ROAR! Rock Of Angels Records. The effort was mixed and mastered by Jens Bogren, best known for his work with ARCH ENEMY, SYMPHONY X, DEVIN TOWNSEND, ANGRA and OPETH, to name a few. The quiet city of Tolentino in the Marche region of Central Italy not only boasts a rich historical background, it is also the place progressive metal band LAST UNION calls home. 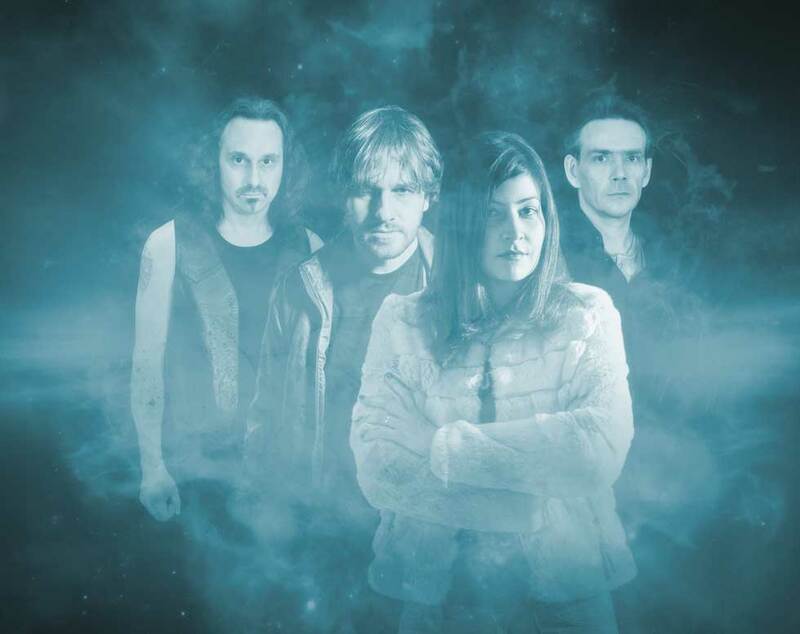 Founded by vocalist Elisa Scarpeccio, guitarist Cristiano Tiberi and keyboardist Claudio Feliziani in 2007, the band - originally known as Blazing Ice - embarked on their journey in the ppursuit of sharing their thoughts and feelings about life, and ultimately their art, with the world. With the assistance of professional session bassists and drummers, the trio established themselves on the Italian scene with a string of shows that helped them evolve and refine their craft. Over the course of 20 shows, LAST UNION presented songs that would eventually make the final cut for their debut album.